RARA AVIS is a new way to save rain forest, as well as learn about it, while you experience the richness and splendor of the most diverse environment on earth. Rara Avis was developed to show that they can make rain forest economically productive and so save it from destruction. In Rara Avis, you will be in a remote virgin jungle — true wilderness — bordering Braulio Carrillo National Park and the Zona Protectora La Selva. At 700 meters (2000 ft) above sea level, the climate stays cool and comfortable year-round (77degrees F or 25 degrees C). There is a lot of rain (it’s a rain forest! ), but mosquitoes are not a problem. Over 340 species of birds have been found at Rara Avis, including sunbitterns, umbrella-birds, great green macaws, parrots, and toucans. 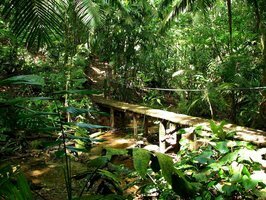 There is a good chance to see monkeys, anteaters, or coatimundis if you walk silently through the forest, or to spot the tracks of tapirs and jungle cats. The treetops are festooned with vines, lianas, bromeliads, and orchids, and there are more kinds of plants, birds, and butterflies than in all of Europe. Your trip begins in the small town of Las Horquetas de Sarapiquí, accessible by bus, car, taxi, or small plane. There you can buy your last supplies (boots, hats, rain gear, flashlights, etc.) before you board a tractor-pulled cart, for the four-hour, 15-kilometer voyage. First you cross two rivers, riding through if the water is low or crossing a swinging foot-bridge when they’ve risen with the rains. Rara Avis has remained pristine because of its inaccessibility: along the way you will see firsthand how rain forests have been cut down wherever they are near roads. Soon you will arrive at El Plástico, the more rustic of the two lodges, named for an abandoned jungle prison colony where the prisoners slept under plastic tarps. The hotel offers basic lodging (bunk beds and shared bathrooms) in the administrative headquarters of the penal colony. There is a classroom for student groups and a spectacular view of the lowlands. For those who want a little more comfort, the Waterfall Lodge lies another three kilometers through the forest at the end of a rough corduroy road. Many people choose to walk through the rain forest while their bags are delivered on the tractor cart. The Waterfall Lodge lies 200 meters from the spectacular double waterfall. Each room has its own bathroom (with bathtubs and hot water) and wrap-around balcony overlooking the rain forest and the lowlands. You can watch birds right from the balcony. Transfers from San Jose area hotels or San Jose’s Juan Santamaría International Airport to Rara Avis are $170.00 each way in a minivan with a capacity of up to 9 passengers. Approximate time from San José to the Arenal area is approx 2 hours and 45 minutes. Transfer from Juan Santamaría International Airport to any hotel in San José $35, including airport assistance, for a minivan with a capacity of up to 9 passengers.